In the autumn, the colors on the rolling hills of Washington County and the mountains of the southern Adirondacks rival anything you can see in Vermont, and New York’s backroads are more peaceful, with less traffic. On our Cheese & Sausage Trail, we link you up to farms that welcome visitors and places where one can stop and shop for handmade cheese, from chevre to ricotta, and a bounty of sausages and other local meat products. In Washington County, only minutes from Saratoga Springs, there are four picturesque covered bridges to explore on your way to the farms. In Warren County, you can take a peek at Lake George, motor along the wild Hudson River, climb Crane Mountain or ride high above the trees in the gondolas at Gore Mountain. Fresh sausage flecked with rosemary, cured meats, a nice wedge of sheep’s milk Pecorino, some olive oil and a bottle of wine. With just one stop at Dancing Ewe Farm in Washington County, you’ll find almost everything you need for a farm-to-table feast inspired by Tuscany, the region of Italy famous for its cuisine. Jody Somers and his wife, Luisa Scivola-Somers, who grew up in Maremma, in southern Tuscany, make Pecorino with milk from their own sheep. Using recipes from Luisa’s family and the Tuscan region, they also make fresh pork sausage and cured meats like capocollo, pancetta and bresaola. This fall, all their farm products will be available, including a pecorino with pistachios, and a variety of hot peppers, artichokes and sun-dried tomatoes preserved in extra-virgin olive oil from Maremma. They also import about 25 labels of wine from the Maremma region. From September to December, visitors are invited to dine at the farm in a Dutch-style barn, but reservations are limited. Facebook. Farm visits by appointment. Email Luisa@DancingEwe.com or call (518) 642-8199. Farm products are also available online and at the Saratoga Farmers’ Market. If you fancy artisan cheese, you’ve heard of Nettle Meadow. 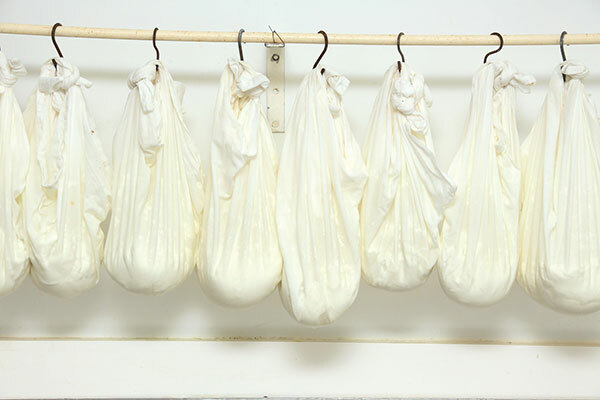 The Adirondack farm is known for its award-winning kunik, a creamy semi-soft goat’s milk cheese served in restaurants and sold at gourmet food stores around the country. More than 4,000 people visit the farm each year, not just to buy cheese but to commune with the goats, sheep and creatures in its animal sanctuary. “We have miniature ponies that we’ve rescued. 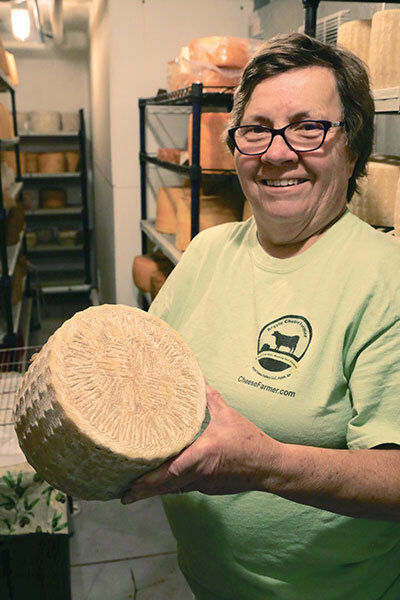 Horses, ducks, chickens, cats,” says Sheila Flanagan, who owns the farm and makes the cheese with Lorraine Lambiase. Tours and samplings are scheduled at noon on Saturdays, and on Oct. 7, Nettle Meadow will hold its annual open house. But visitors are welcome any time to look around on their own. “They can see pretty much everything. We’re kidding and lambing all year-round,” Flanagan says. In the fall, the popular cheeses are a fromage frais made with an apple cider reduction and a pumpkin spice chevre. 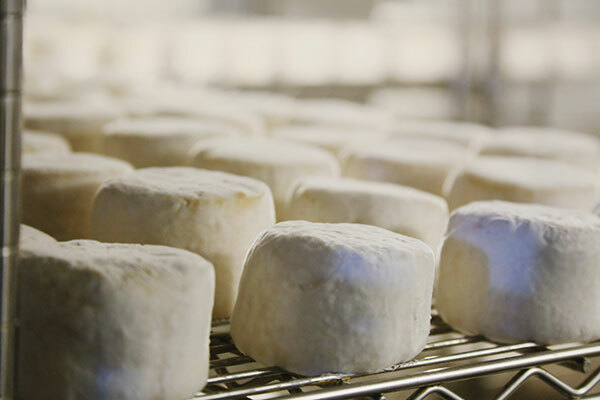 This will be the first fall season for their prize-winning Sappy Ewe, a semi-aged sheep and cow’s milk cheese infused with maple syrup and bloomed in the aging room. For visitors looking for a bird’s-eye view of the foliage, Nettle Meadow is less than a mile from the trailhead for Crane Mountain. Gore Mountain, 12 miles away, offers leaf-peeping gondola rides. Facebook | Open 11 a.m. to 4 p.m. daily. How do you tell if a cheese curd is fresh? At Fairview Farm, Marge and Dave Randles will tell you that a curd should “squeak” when you bite into it. 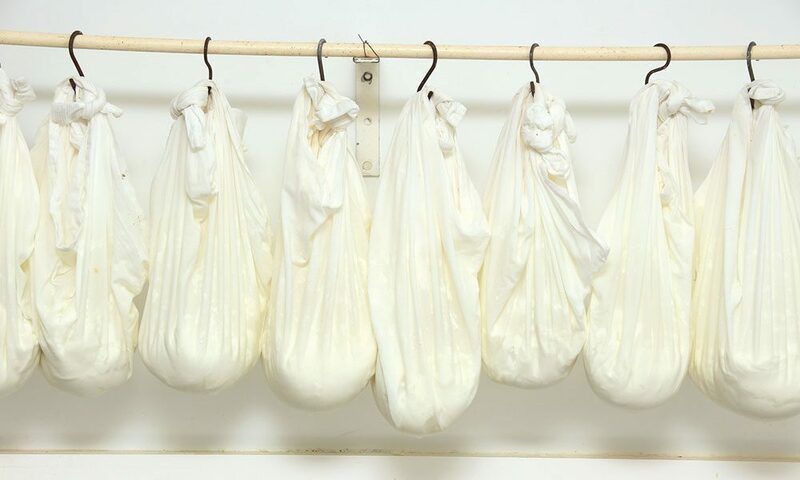 Cheese curds, in five flavors, like sun-dried tomato and chive, and whole-milk Greek yogurt are the most popular Argyle Cheese Farmer products. “My husband does the yogurt; I do the cheese,” says Marge. At last year’s New York State Fair, their chocolate yogurt won a gold medal. Dave makes several flavors of yogurt, including maple, and yogurt smoothies with tempting names like vanilla chai and ginger pear. All their products, which include aged cheeses, cheese spreads and cheesecake in a jar, are made with hormone-free milk from their herd of 50 cows, which eat forage that is 100 percent grown by the Randles. The help-yourself farm store is in a room just inside the cheese plant, a red steel building. No appointment is needed. Just drive in, park and go into the store. You can also visit the farm during the annual Washington County Cheese Tour, held each year in early September. The Randles helped launch the event in 2006. 990 Coach Hill Road (at the Coot Hill Road intersection), Argyle | cheesefarmer.com | (518) 638-8966 or 222-0667, Facebook | Self-service farm store open dawn to dusk. Products also available in Saratoga Springs at Saratoga Farmers’ Market, Four Seasons Natural Foods and Healthy Living Market & Cafe. At Moxie Ridge, a one-woman farm in Washington County, Leah Hennessy is devoted to “heritage food,” which means it is made or raised the old school way. If you visit her 200-year-old farmstead, you can nibble on traditional French-style cheeses and meet uncommon animals, like Mulefoot pigs and Shire horses. 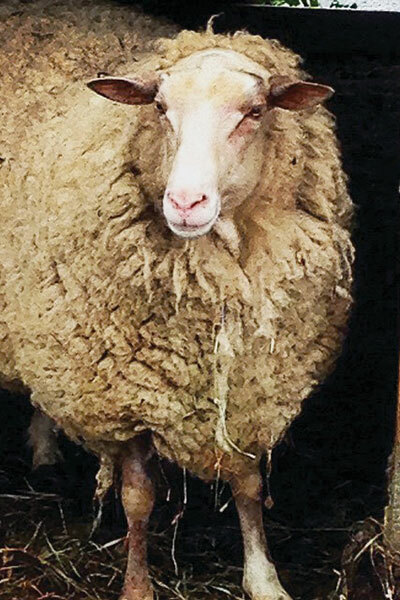 “When people come here, they will be exposed to livestock breeds that maybe they’ve never seen before,” says Hennessy. The black hogs are an endangered American breed with a single toe instead of a cloven hoof, and the endangered horses, which do the hauling and clearing on the farm, look like black Clydesdales. 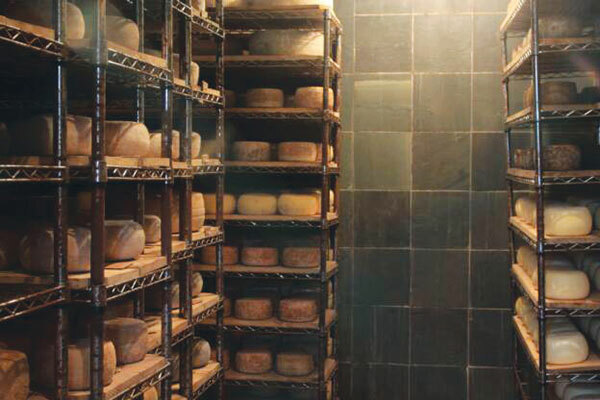 In her creamery, Hennessy crafts fresh and aged cheeses with milk from her goats and from cows at a neighboring farm. She also raises a special meat chicken that is a very active free-range forager. Using a 500-year-old French technique, before the chickens go to the butcher, they are “milk-finished” with a diet of goat milk and whey. When Hennessy shows visitors around, she tells them about her new Heritage Food Project, which supports traditional livestock. “I like to educate people in a fun way,” she says. If the weather is good, cheese sampling happens on a deck with a view of the goats in pasture and the hills in their autumn dress. (518) 620-6464, Instagram | Visits by appointment, or text or phone 518-620-6464. Farm products also available at Saratoga Farmers’ Market. More than 70 years old, Oscar’s is a North Country landmark beloved by generations of tourists and locals. Summer is the busiest season for this pork palace, as campers want their bacon to sizzle over a fire and hikers scoop up their jerky. But the store is open all year round, and from September to May, when business calms down, you can order a sandwich to go. “Our most popular items are our bacon and then our smoked pork chops and ham,” says Joq Quintal, the third-generation operator of the family business. 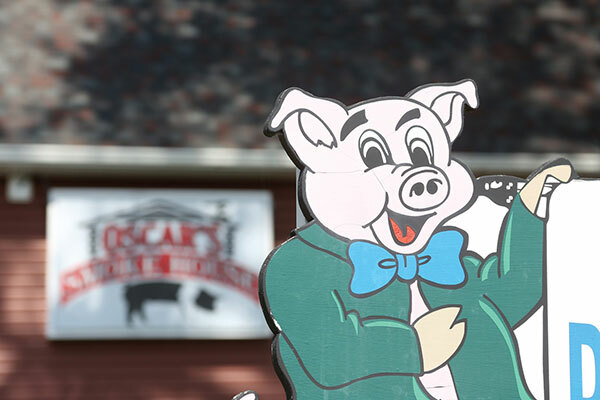 Oscar’s sells more than 150 kinds of smoked foods, including ham, cheese, sausage, beef, venison, chicken, lamb, catfish, trout and giant turkey legs. Everything is smoked on site. “We don’t make the cheese but we smoke cheese,” says Quintal. Among the newer products is a smoked Danish bleu cheese and a nitrite-free bacon. TV chef Rachael Ray, who grew up in Lake George and owns a cabin in Lake Luzerne, shops here whenever she’s in the area. The other Oscar’s celebrity is the old porker on the front lawn. Baby boomers have been known to squeal with delight at the sight of the black-and-white pig statue, as it reminds them of childhood visits to Adirondack theme parks. (518) 623-3431, Facebook | Open 7 a.m. to 6 p.m. daily. Products also available online. Nettle Meadow Farm is one of nine sites on the annual Thurman Fall Farm Tour on Saturday, Oct. 7 in Warren County. The free, self-guided tour is scheduled from 10 a.m. to 4 p.m. and features eight farms, including Peru Llama Farm, and Martin’s Lumber, and a quilt show. Valley Road Maple Farm will host a pancake breakfast with sausages from Oscar’s Adirondack Smokehouse. Nettle Meadow will serve a buffet luncheon.